It is with great sadness that we announce Mrs Valda Evans passed away on Saturday 9 September 2017 after a short illness. Mrs Evans was the founding President of Ashbury Netball Club from inception in 1972 to 2017. She was the ‘tuck-shop’ lady at St Francis Xavier’s Primary School for 24 years (retiring in 2003). 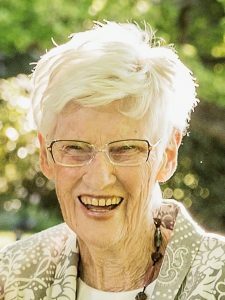 Prayers for the Repose of the Soul of Valda will be held within the Mary Mother of Mercy Chapel Rookwood Catholic Cemetery, Barnet Avenue, Rookwood on MONDAY (September 18th, 2017) commencing at 12.30 pm followed by a burial within the adjoining Cemetery grounds.